Rod Taylor was a guest on this long-running Irish chat show, to promote "Cry of the Innocent," which was in production at the time. The episode is notable for the arm-wrestling match between Oliver Reed and Rod, pictured below in a photo circulated on social media by Irish TV network RTÉ on the 28th anniversary of the episode. Seated in the background are author Frederick Forsyth and former RTÉ producer Morgan O'Sullivan. Forsyth wrote the story upon which "Cry of the Innocent" was based, and O'Sullivan was the film's executive producer. A trivia item on IMDb says that Oliver Reed and Susan George were on the show to promote their movie, "Tomorrow Never Comes." The item says that Reed, who had "over-imbibed," became amorous with Susan George. 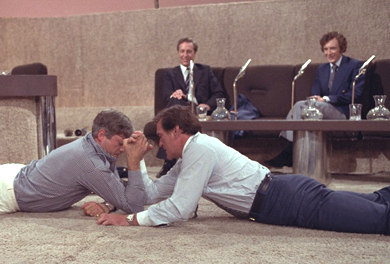 To help distract Reed, fellow guest Rod Taylor challenged him to an arm wrestling competition. 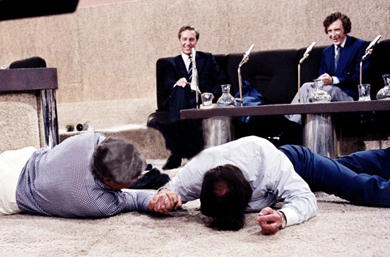 Another version, related by a viewer, states that the show's host, Gay Byrne, goaded the two actors into arm wrestling on the studio floor. The viewer added, "PS: Rod Taylor won." Another fan also reported that Rod opened Waterford [Ireland] City Shopping Centre with Byrne in the mid- to late-1970s. Byrne was the host of "The Late Late Show" from its start in 1962 until 1997. The show continues today and is regarded as an Irish television institution. It airs on Raidió Teilifís Éireann (RTÉ) and is the world's second longest-running chat show, after the "The Tonight Show" in the U.S.
Wikipedia about "The Late Late Show"